WASHINGTON - President Donald Trump has a new message for the NFL: Change or business is "going to go to hell." Trump said Wednesday that the NFL is in a "really bad box" over the issue of players kneeling in protest during the national anthem. He said ratings are falling, and the only thing doing well is the NFL pregame show. Beginning with a rally last Friday in Alabama, Trump has been criticizing players who kneel during the "The Star-Spangled Banner" to protest racial injustice. He has said the NFL should require that players stand during the anthem. Trump said Wednesday there are other places during a game where players can protest "but they cannot do it during the national anthem." "You cannot have people disrespecting our national anthem, our flag, our country," Trump told reporters as he departed the White House for a trip to Indiana. "In my opinion, the NFL has to change. Or you know what's going to happen. Their business is going to go to hell." Earlier on Twitter, Trump said he had spoken Tuesday with Dallas Cowboys owner Jerry Jones. "Jerry is a winner who knows how to get things done. Players will stand for Country!" Trump tweeted. 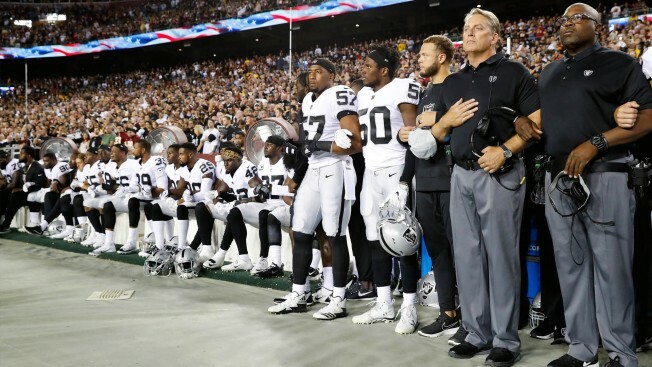 On Monday night, Jones - a Trump supporter - and his players knelt arm-in-arm before the anthem, then rose for the playing of the anthem before the team's victory at the Arizona Cardinals. Trump has spent several days lashing out at players who kneel, a practice that started with a handful of players to protest racial issues, including police brutality. Responding to Trump, hundreds of players have been sitting, kneeling, locking arms or remaining in locker rooms.